When folks wonder why blue jays are scarce they turn to the Internet and find my 2012 blog post “Have You Seen Any Blue Jays Lately?” In the past two+ years 116 readers have commented on the status of blue jays where they live. The most recent comments are on the absence of jays: Where have they gone? Why did they leave? When will they come back … if at all? 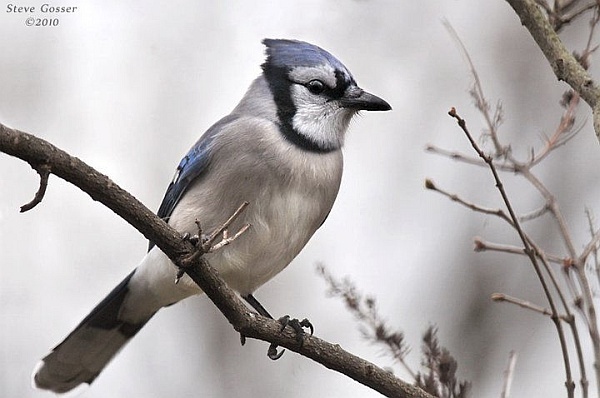 Over the winter blue jays eat acorns, beechnuts, hazelnuts, hickory nuts and other mast (nuts). Their range map looks as if they never migrate but they will leave if nuts are scarce. How can we know if the blue jays will leave? Check the Blue Jay Forecast. Every fall Ron Pittaway produces a Winter Finch Forecast for Canada based on the abundance of tree seeds in Canada’s forests. The finches in his report eat a wide variety of seeds including spruce, fir, birch and mountain ash. If food is abundant the birds stay home all winter. In poor mast years they irrupt southward. Here in Pennsylvania we wait for Pittaway’s forecast to tell us which species will visit us in coming months. Click here for Ron Pittaway’s Winter Finch Forecast. Scroll down to read about blue jays. And how does day one of retirement feel? Nannie, I am still Go! Go! Go! I’ve already blogged + walked for 2 hours in Schenley Park + been to the library + read a book … and I can’t believe it’s only lunchtime. I think it’s going to take me a while to unwind. Blue jays? They’re all in my backyard, lately! I have my share of Jays in Lawrenceville, too. Maybe proximity to the Cemeteries…..
Been hearing Blue Jays recently in Tarentum and Brackenridge Parks along the river.